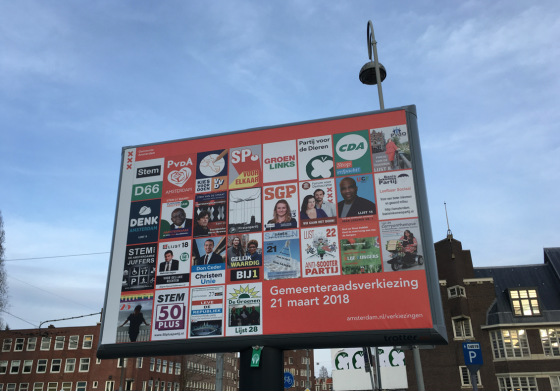 GroenLinks was confirmed as the big local election winner in Amsterdam when the results were finally published on Friday morning after what officials said was a ‘mega operation’ to count over one million ballot papers. Thierry Baudet, leader of newcomer Forum voor Democratie, was elected to the 45-seat Amsterdam chamber on preference votes as one of three FvD councillors, but said earlier he would not take up the seat. Denk, the largely immigrant party, is also a newcomer on Amsterdam council with three seats, and had more votes than the FvD. In line with the forecast, GroenLinks boosted its share of the city council vote from six to 10 seats – according to preliminary results. D66, who overtook the PvdA four years ago, slumped from 14 to eight. Housing had been the biggest issue in the local campaign and support for the Socialist Party, who held the housing portfolio, has halved. The party had also campaigned on an Amsterdam for Amsterdammers ticket. ChristenUnie, Bij1 founded tv presenter Sylvana Simons and the pensioners party PvdO all debut with one seat in the 45 seat council chamber. In total, 12 parties are now represented on the city council.